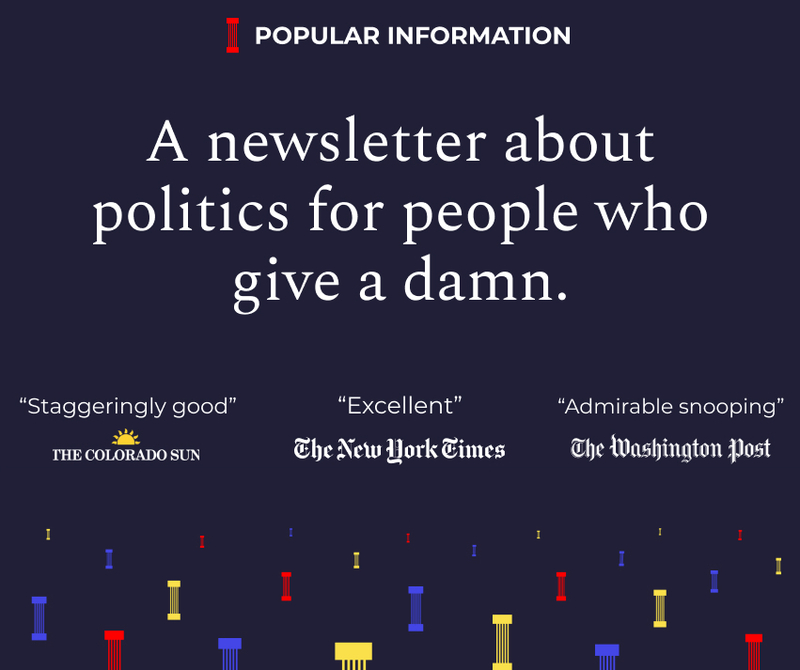 Welcome to Popular Information, a political newsletter for people who give a damn — written by me, Judd Legum. Send your feedback to judd@popular.info or tweet your thoughts using #popularinfo. If you’ve been forwarded this newsletter, you can sign up at popular.info. Jared Kushner’s family real estate business was just bailed out of a billion dollar problem, 666 5th Avenue. We should all pay close attention. Why? The core principle of any democracy is that the people working in the government, whether elected or appointed, work for the best interest of the people and not themselves. That’s why there is a long tradition of the President and high-level White House staff divesting themselves of any assets which might present even the appearance of a conflict-of-interest. This usually involves either selling the assets for cash or placing them in a blind trust, where they are controlled by an independent third party. Donald Trump eviscerated this tradition when he maintained full ownership of his far-flung businesses. Jared Kushner, now a senior adviser in the White House, followed in his father-in-law’s corrupt footsteps. Kushner’s decision has real consequences for democracy, but you don’t hear much about it because large real estate transactions are complex. This complexity acts as a shield, protecting Kushner from most criticism. Here’s the explanation of what’s been going on with Jared Kushner and the tower from hell — 666 5th Avenue. In 2007, a 27-year-old Jared Kushner paid $1.8 billion for a 41-story office tower on 5th Avenue. It was, at the time, a record price for an office tower and three times more than its previous owners had paid just six years prior. His timing couldn’t have been worse. Kushner bought at the height of the real estate bubble, just before the Great Recession. In short order, the commercial real estate market in Manhattan collapsed. Worse, the tower was aging and was not attractive to new tenants. The property has been hemorrhaging millions ever since. The tower is currently about 30% vacant. On November 8, 2016, Donald Trump won the presidency. Just eight days later, Jared Kushner was at the Waldorf Astoria hotel seeking hundreds of millions of dollars for his troubled tower. With “$2,100 bottles of Château Lafite Rothschild” at the table, Kushner sought financing from Wu Xiaohui, the chairman of Anbang Insurance Group, a company with ties to the Chinese government. There was no time to waste because the $1.2 billion mortgage was due in February 2019 and traditional financing was unavailable since the tower was widely believed to be worth less than what was owed. Simultaneously, Trump had made Kushner the incoming administration’s primary point of contact with the Chinese. Kushner “met regularly” with Chinese ambassador Cui Tiankai. Kushner was credited with convincing Trump to quickly reverse course and endorse the “One China” policy, which Trump had publicly rejected in December 2016. As he transitioned into the White House, Kushner “sold” his interest in 666 5th Avenue. The buyers were his brother, Joshua, and a trust controlled by his mother, Seryl. Kushner has retained absolute ownership of about 90% of his real estate holdings, according to an analysis by the Washington Post. The deal fell through, however, after the announcement sparked an avalanche of criticism about conflicts-of-interest and national security concerns due to Anbang’s murky connections to the Chinese government. With the collapse of the Anbang deal, it was back to the drawing board. With Jared Kushner in the White House, he was unable to take the lead in securing a deal. The task fell to his father, Charles, who was convicted in 2005 on charges of tax evasion and witness tampering. In April 2017, Charles Kushner secretly “made a direct pitch to Qatar’s minister of finance” to bail out 666 5th Avenue. Qatar didn’t go for it, and Jared Kushner later provided critical support to Qatar’s neighbors, including Saudi Arabia and the United Arab Emirates, when they instituted an economic blockade against Qatar. When news of the meeting became public in 2018, Charles Kushner dismissed the meeting with the Qataris as a “courtesy,” but pledged to avoid investments from foreign governments. Ever since then, the clock has been ticking. On Friday, the Kushners announced 666 5th Avenue was being purchased, in full, by Brookfield Asset Management. Brookfield is a major real estate developer based in Canada but its leading investor is the Qatari government. So who is behind the deal and what are the terms? No one is saying. The terms were not disclosed, and the investors behind the Brookfield subsidiary that made the purchase are secret. One person who has a keen interest in all this is special counsel Robert Mueller. A court ordered the government to reunite all families separated by the Trump administration’s “zero tolerance” policy ten days ago. As of Friday, however, 572 children remained apart from their parents. In most of these cases, the government has lost track of the parents. More than 450 mothers and fathers were deported without their children. In a court filing, government lawyers argued that it should be up to the ACLU to find them. Plaintiffs’ counsel [the ACLU’s lawyers] should use their considerable resources and their network of law firms, NGOs, volunteers, and others, together with the information that Defendants have provided (or will soon provide), to establish contact with possible class members in foreign countries. The ACLU’s lawyers flatly rejected this argument. Not only was it the government’s unconstitutional separation practice that led to this crisis, but the United States Government has far more resources than any group of NGOs (no matter how many NGOs and law firms are willing to try to help). Plaintiffs therefore hope that the Government will take significant and prompt steps to find the parents on their own. In a court hearing on Friday, federal judge Dana Sabraw rejected the government’s position. The Trump administration, not the ACLU, was responsible for reuniting the families, Sabraw ruled. The judge ordered the Trump administration to provide the ACLU with detailed information about the still-separated families by August 10. The back and forth makes one thing clear. The government never had a plan to reunite these families. That’s why it deported so many parents without any system to keep track of them. Trump’s executive order, issued June 20, said nothing about reuniting separated families. It’s unclear if the government even has anyone responsible for overseeing the reunification process. On Friday, Judge Sabraw ordered the government to identify someone. Absent the ACLU’s lawsuit, it’s unclear if any families would have been reunited at all. Why is Donald Trump lying to his lawyer? The infamous Trump Tower meeting in June 2016 between Donald Trump Jr. and Russians promising dirt on Hillary Clinton was thrust into the spotlight again over the weekend. The catalyst was a Washington Post report that President Trump is concerned his son may have “inadvertently” broken the law. As one adviser described the president’s thinking, he does not believe his son purposefully broke the law, but is fearful nonetheless that Trump Jr. inadvertently may have wandered into legal ­jeopardy. The first official acknowledgment of the meeting was issued on July 8, 2017, under the name of Donald Trump Jr. The statement claimed his meeting with the Russians was “primarily” about adoption. It was a short introductory meeting. I asked Jared and Paul to stop by. We primarily discussed a program about the adoption of Russian children that was active and popular with American families years ago and was since ended by the Russian government, but it was not a campaign issue at the time and there was no follow up. I do want to be clear -- that the president was not involved in the drafting of the statement and did not issue the statement. It came from Donald Trump Jr. So that’s what I can tell you because that’s what we know. In a memo obtained by the New York Times in June, Trump’s lawyers admitted that Trump was not only involved with but personally “dictated” Trump Jr.’s initial statement. Sekulow appeared on ABC on Sunday morning and admitted his claims about the Trump Jr. statement last year were false. “I had bad information at that time. I made a mistake in my statement. ... That happens when you have cases like this,” Sekulow said. There is really only one person who could have provided Sekulow with this “bad information” — his client, Donald Trump. This raises an important question: If Trump did nothing wrong, why did he lie to his lawyer? It does not add up. Trump is now admitting he dictated the statement but still insists he was not told about the meeting in advance. Michael Cohen, Trump’s longtime “fixer,” says that Trump did know about the meeting in advance. Cohen says he was present when Trump Jr. told his father about the upcoming meeting. It’s possible that now, after dictating a highly misleading statement about the nature of the meeting and then lying to his own attorney about his involvement in crafting the statement, Trump is now telling the absolute truth. But it seems unlikely. Thanks for reading! Please send your feedback, including ideas for future emails, to judd@popular.info. Or tweet your thoughts using the hashtag #popularinfo. You can follow me on Twitter @juddlegum.